You are stalked by an invisible psychopath, intent on killing your child and substituting a demonic changeling -- a creature who will grow to grotesque size, kill your other babies and take over your home. Science-fiction fantasy? This terrifying scenario is played out every day in the marshy reed beds of southern England. 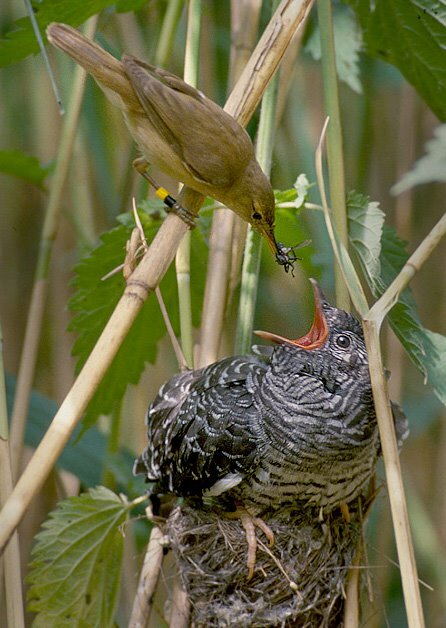 Cuckoo birds constantly seek to penetrate the Reed Warbler's nest and lay eggs that will be raised by unsuspecting foster-parents, robbing them of their chance for reproduction. The ratio of parasites to host fluctuates chaotically -- even wiping out some Warbler populations. The struggle to avoid nest parasites can mean the thin edge between survival and extinction. Reed Warblers can fight back by rejecting eggs or attacking (mobbing) the Cuckoos -- assuming the Warblers can recognize them. But many Warblers have never met a nest parasite -- or even glimpsed the cheating birds responsible. Cuckoos are secretive, and they may also resemble scary predators, such as the Sparrow Hawk. Yet, the Warblers somehow accurately characterize the Cuckoo and attack, while ignoring other birds (including as innocent parrots biologists have planted as decoys). How does the Warbler know to target this seldom-seen enemy? Experiments suggest the answer lies in the Warbler's astute powers of observation. Warblers who witness their neighbors mobbing Cuckoos quickly copy their behavior. Under pressure for its existence, the Warbler is smart enough to trust the experience of a tiny minority of peers who know the dangerous species -- and that knowledge lingers in the social community. The "arms race" never ends. The Cuckoo is constantly working out new strategies to improve its success parasitizing nests -- evolving eggs that closely resemble their hosts, and developing new behaviors for eluding detection. 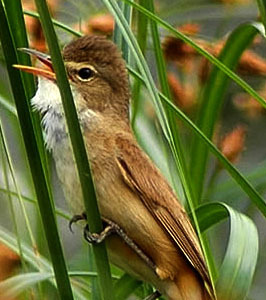 However, the plight of the Reed Warbler teaches us something useful about humanity. An arms race also confers hidden benefits -- sharpening adversaries even as they struggle against mutual annihilation.